Try getting all the materials in advance to build a house, and never once running to Home Depot for the nails, screws, or pieces of wood that were overlooked. The Pitcairn Islanders that we met on our first landfall in Polynesia have to do this – their supply ship, the ‘Claymore’ only comes every three months, assuming the weather is fine. 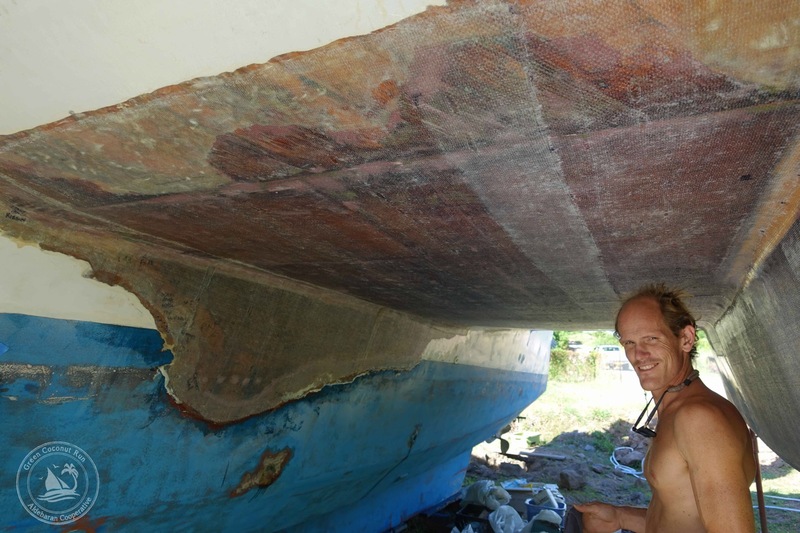 This is also what we had to do in Hiva Oa Boatyard, in order to not be stuck there for weeks. To get things done at sea and in remote places, it helps to observe the rule of the ‘six Ps’ : “Prior Planning Prevents Piss Poor Performance”. If your planning has errors (as it most certainly will) you’ll then need to improvise. I was trying to follow the six Ps when I carefully ordered a box of items from Westmarine for Pierre (Sabrina’s brother) to pick up and bring to Marquesas where he was joining Aldebaran. Inside was everything from sand paper, blue tape, face masks, protective suits and fiberglass. This was the “Operation Rescue Aldebaran” box. But sadly, I didn’t order enough fiberglass. “Should have ordered twice the amount,” is a refrain we start hearing around cruising sailboats. “Might as well have extra.” This is sound advice, but it is also vexing when you consider how expensive marine parts are, and the fact that boats don’t have endless space for spares. 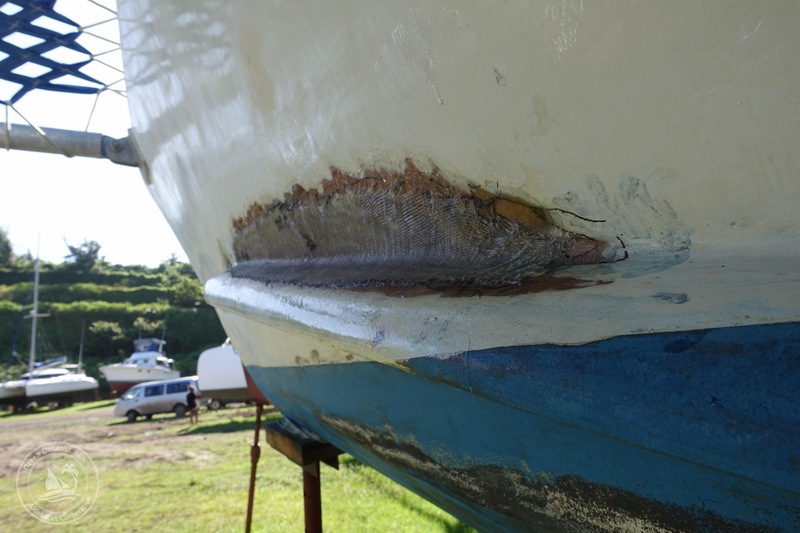 Luckily, the Hiva Oa Boatyard had a huge roll of fiberglass – but it was the super heavy duty kind. I had pre-ordered two gallons of Epoxy but now I wondered: would it be enough for all this extra thick fiberglass? Would we run out of epoxy, and have to use inferior resins (ie. polyester) or wait for the next ship to visit? Either proposition was gloomy. Fiberglass is just a dry fibrous cloth; when you add resin, it becomes a wet and sticky carpet, which then cures into a rock-hard plastic ‘glass’ after 5-20 hours, depending on the catalyst used, ambient temperature, and humidity. 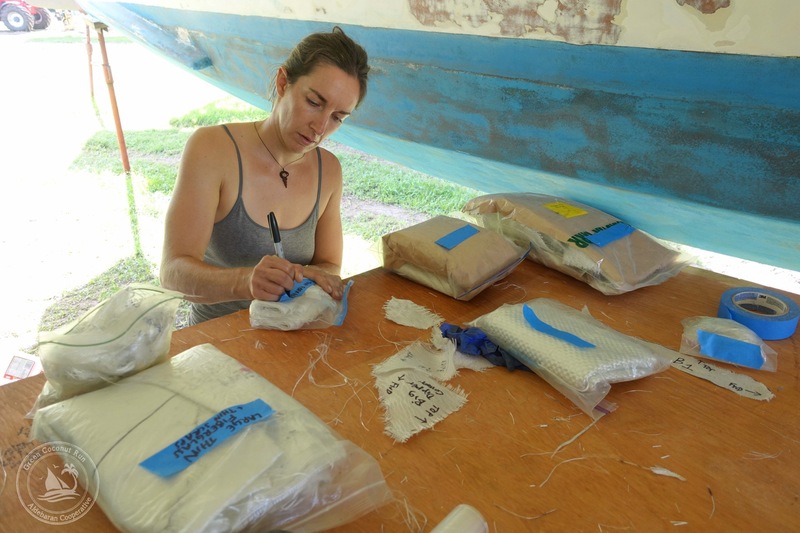 Sabrina prepped about 75 pieces of fiberglass – cutting them to size, labelling in neat piles – which in itself took an entire day. There were two dozen small repairs to prep in addition to the major damage area. The hardest to apply and largest were over our heads on the roof. In comparison, the odd-shaped wall pieces were a piece of cake. Envision soaking a large floor carpet in honey until it is fully saturated, rolling it up, and holding the roll above your head. This already is a workout. Now try carefully unrolling the carpet while getting it to stick upside down to a tacky surface on the ceiling, not allowing any air pockets. Oh yeah, did I mention it is a ticking time bomb? Once it starts to cure it becomes brittle and inflexible, so you have to move fast to fully adhere it while it is pliable (it goes off in 20-30 minutes). This was our experience fiberglassing the large repair on the roof of Aldebaran, fighting the forces of gravity. 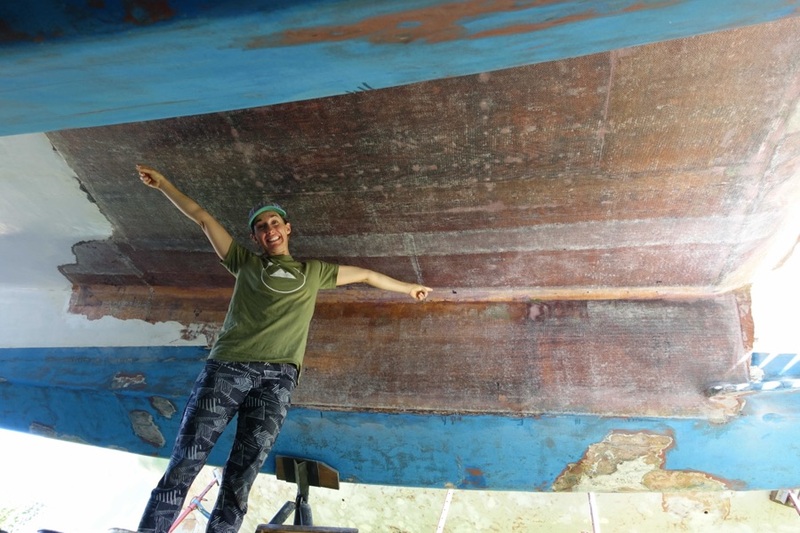 Thanks to our experience in the Ventura Boatyard with heavy fiberglass in the past, we knew the technique: place the roll of fiberglass on the ground (on a sheet of plywood) and saturate it fully before putting it on the surface. I watched with apprehension as we poured more than a gallon of epoxy onto the thirsty fibers. Sabrina and I recruited two guys to help us hold the rolls of fiberglass, as we alternated between carefully unrolling them and madly pressing them to the roof with special paint rollers, trying hard to get them to stick. One of our helpers was a French boat-hitchhiker who was incredibly nice. Our other helper was a local teacher from the Tuamotos named Leon who was here in Hiva Oa learning boat repair techniques to take back to his home atoll, Makemo. We became friends with the cheerful Leon, and plan to visit him on our first stop in the Tuamotos. After struggling for three demoralizing ‘hump’ days with our Gremlins (the mystery wet wood, and the rotten side wall) we had finally crested the hill. Contrary to every expectation, the sun kept shining, which I thanked profusely every day. 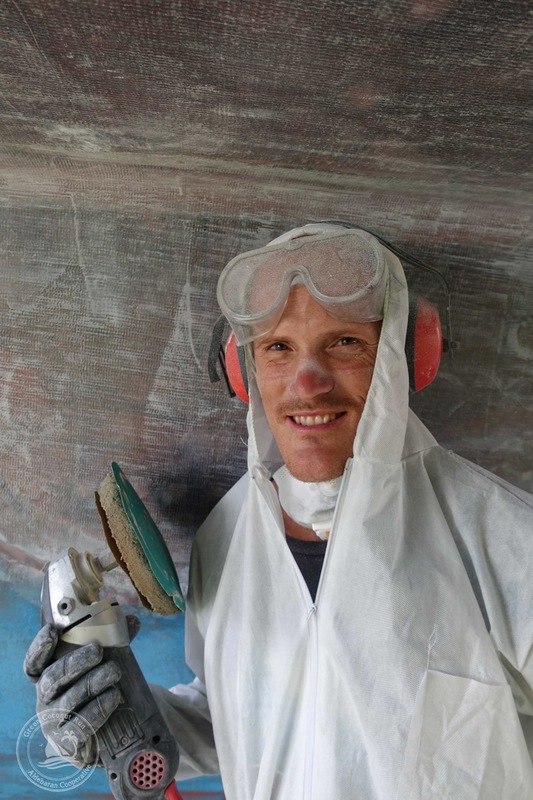 We had sprinted for the last 72 hours cutting and applying fiberglass, constantly struggling with wet gloves sticky with resin, itchy rashy skin from the fiberglass, and running on coffee and banana smoothies. 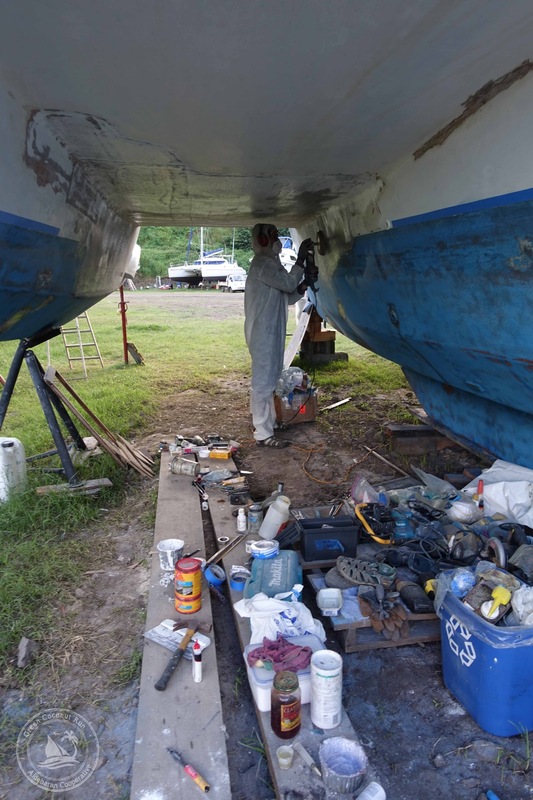 As you’ve learned from our last posts, prepping the surface with grinders and applying the fiberglass is just part of the battle– we must then finish the job with sanders and fillers and paint to make it look half-decent (which is also important for diagnosing any future problems). 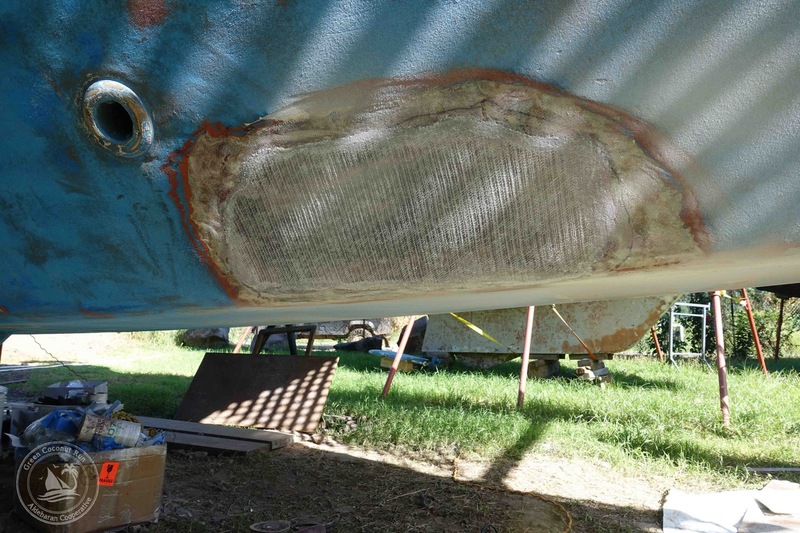 But now the boat was sealed with new skin, watertight once again, and this was a huge relief. Everything else we did during the final five days at the boatyard was frosting on the cake, but we raced against time to make the most of it. Can’t wait to see the new gleaming Aldebaran. Your analysis is spot-on Michael… glad we were able to convey what a challenge this was… we are so glad to see here painted and repaired now. you are such winners on my book! you don’t give up, you get results, … you are a lucky pair!